OBSERVER Photo by Nicole Gugino: Gowanda native and architect William Haskas points to plusFARM’s other design work both locally and abroad. 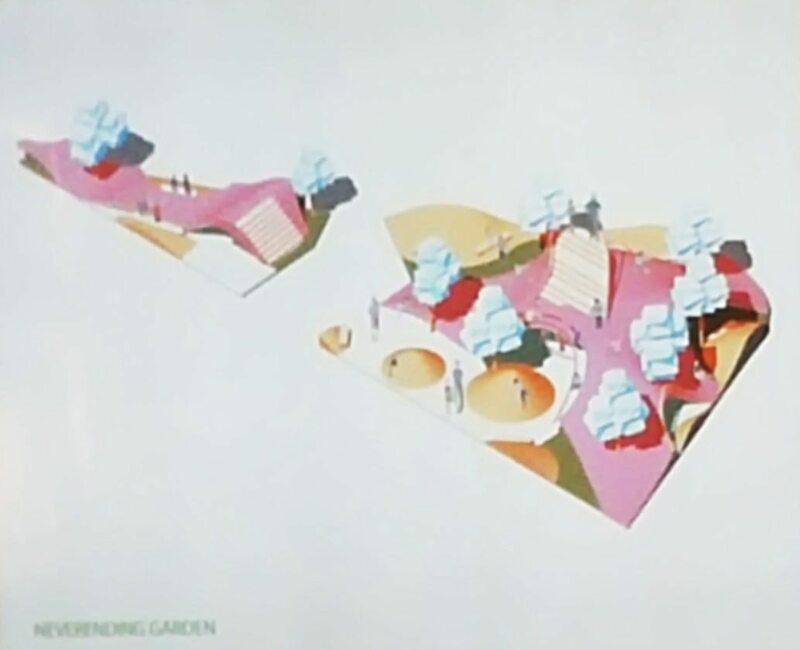 Submitted Photo: Pictured is a design for the green space at the intersection of Sixth and Main streets in the city of Dunkirk. When you think of a playground, a slide, monkey bars and swings come to mind — all something that may not fit into the grassy triangle at the intersection of Sixth and Main streets. However, plusFARM architects William Haskas and Matei Denes of Brooklyn are not your typical architects, and plans for the site are not your typical playground. 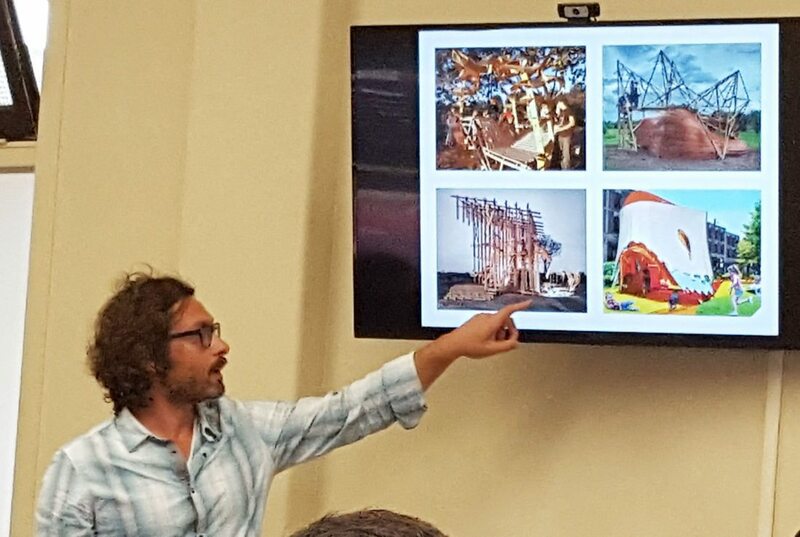 Haskas, a Gowanda native, said his parents’ accomplishment in building a playground in the village when he was a kid inspired him to pursue architecture as well as a belief in free play. “We really believe in free play and the idea is kids generate the content through their own imagination,” Hakas said. “They learn social skills, how to negotiate territories with other kids, whether older or younger, through a series of landscapes as we call them, where it doesn’t say ‘swing here’ or ‘jump here’ or ‘run here.’ Children learn to have interaction because there is no instruction, they invent that themselves, they learn to come together whether they’re of the same background, the same economic stock, the same social strata; they negotiate these terms on their own,” he explained. The pair recently gave a presentation to the Economic Development Committee on their design, commissioned by a community group led by Harriet “Skeeter” Tower. The pair said they are accustomed to working on a budget and described their design as having undulating surfaces, sand lots, landscaping for climbing, a perch and natural barriers. Despite assurances of a plan, the most-heard feedback was that of a concern for safety. “I don’t think this is the right location. Personally, I’d like to see us put a bench there and some wild flowers or something and make it very simple. I think this would be much better suited in Washington Park where there’s more area to play, there’s places for parents to park, it’s not on a street that has curve and a lot of heavy traffic. We also have a Franklin Avenue Park, we have a park above the tracks and below the tracks that sits empty. We’ve got one to the east and one to the west to the location that you’re looking at and it took me eight years to get a very small play structure in the Fourth Ward for the kids another would be wonderful. But when we had the meeting last time, we had concerns from both the Police and Fire departments,” Fourth Ward Councilwoman Stacy Szukala said, also noting liability concerns that could leave the taxpayers on the hook in case of an accident. Denes explained a three-pronged approach including traffic calming measures, concrete/landscaped barriers and the visibility of people will help make the area safer. Haskas added this is something the community desires. “This project that we are part of because a bunch of folks believe in where they live and are changing where they live. I believe this is the right site because of what I’ve seen and heard from the people,” he said. Councilman-at-Large Andy Woloszyn noted there has been a “history of outcry” regarding playgrounds near Route 60, also noting concerns with the placement of a driveway and water/sewer infrastructure. Denes said they are not turning away from safety concerns. “We understand that there are safety concerns about this site. … We want to address those, we don’t want to pretend that they’re not there. … But, we think that this project can offer so much to the community if it’s done right,” he said. Not all the feedback was negative, however. Third Ward Councilman Adelino Gonzalez said he supports the project. “The concept that you speak about is important. … To see children when they get together; they don’t care about race, color, creed. … I envisioned many years ago, even before I was in politics, an entrance to Route 60. There should be something there that tells you this is a great place to live,” he said, arguing against safety concerns with logistical solutions. Development Director Rebecca Yanus noted it is more than a playground. “All these concerns are going to be taken into account. I want people to remember this is a project that is not just a playground or park, but this is a revitalization of that neighborhood,” she said. John Ames, a member of the Northern Chautauqua Community Foundation’s Local Economic Development Committee, also saw more in the project. “I understand the concerns with safety issues, but I think the real value in my mind that this project gets to is two other things. One of them is dealing with complete streets, which was passed by the city. This may be a catalyst, regardless of what happens to this piece of property, to have the city reconsider the whole issue of complete streets and the way in which pedestrians’ concerns are going to be addressed for this and then as a result of that discussion how it might be addressed for the city as a whole. The second thing I’m thinking of is something you referred to as this being an entrance to the city. It becomes a statement to people who are coming into the city, just to investigate or simply passing through, they see this as a statement of what the city can be. So, perhaps this park may not be put together in exactly the way it’s been proposed today, but I think it’s going to be an extremely valuable discourse to discuss in full based on this whole concept of what this entrance to the city should look like as a larger issue,” he said. The project is being handled through the development department going forward.